marta writes: and i thought these strawberries were big. and i thought these strawberries were big. all i have to say is big things are in the works. i can't wait to spill all the juicy details. I love your blog Marta, and I think you are completely adorable. I am so, so excited for you, whatever your upcoming happy news is--I wish you all the best! But I have to say that these "teaser posts" you frequently do are really, really annoying. Why flaunt a secret? Why not just wait to post about something until you're ready to post about it? Just a thought. I really am so excited for you, though! You deserve all the good things that come your way. wow, marta, these strawberries are enormous!!! 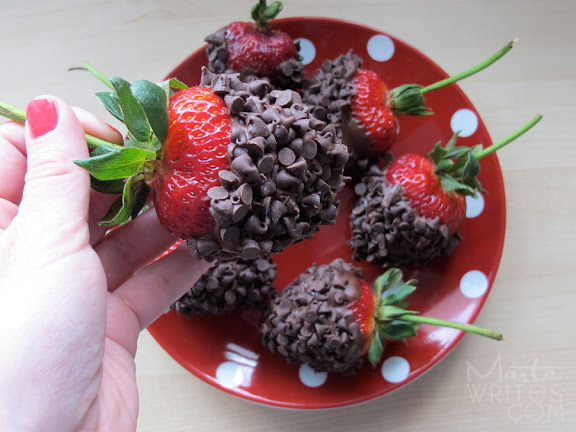 I love this twist on the traditional chocolate coated strawberries - those tiny chocolate chips are amazing! yum yum yum! I wish I could find strawberries around here with the stems still attached. Love the mini chocolate chips too. :) Can't wait to hear what is going on. I hope you share soon! What a cute idea, Marta! The mini chocolate chips are darling. Will have to think of a way to use it...as soon as I start eating sugar again. Can't wait for your big news. Wow, those strawberries look amazing! Looking forward to reading about your big news! Oh Yum!! Yeah for exciting news. ooh, sounds very exciting - can't wait to hear more. 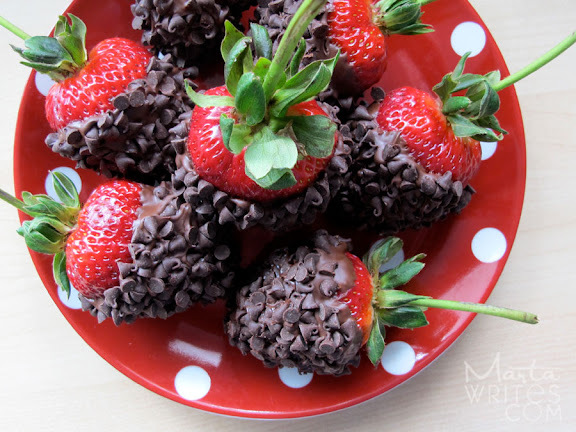 And in the meantime I think I need to make some chocolate chip strawberries! I think I have a pretty good idea about your big, juicy news and I am so, so, so excited! Oooh! I love a good teaser post, and you are the best at them. *Note to Anonymous: A good writer knows that foreshadowing is one of the most important parts to a story. Those strawberries were as amazing as they looked. Seriously. Jer and I dream about them. So excited for your big news! YAY!!!!!! YUM!! I have a hopeful hunch what your big news is; can't wait to hear! I love how you pre-announce a surprise—it's like you're saying you don't want to tell until you know we're all here together to get the news at the same time. I like feeling like I'm part of the surprise party group!